There was a little whipsawing among some data, but the overall picture remains consistent. Industrial production is the ultimate coincident indicator. It is almost invariably the number that determines economic peaks and troughs. and is in line with any number of similar monthly numbers during the expansion. Again, there's nothing here to suggest any change of trend. In particular, the energy production sector of the economy which has done so much to undergird the overall number for the last 9 years, continued to improved. As the graph shows, this is on trend for the entirety of this expansion, and is also a new high, surpassing that of last winter. Since this is a short leading indicator (3 to 6 months) of the trend in YoY% growth in employment, it suggests that the recent run of strong monthly jobs numbers should continue, averaging in about the 175,000 to 200,000 range over the next few months. Earlier this week I wrote that real retail sales would show how well the average household is doing holding up, considering the stagnation of real wages over the last several years. Needless to say, the answer is "fine, so far." I hope to say much more on this at some point in the next week or two. 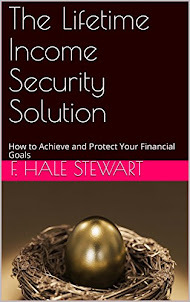 Interest rates and money supply are the two long leading indicators under the control of the Fed. With yesterday's indication that they will hike 4 rather than 3 times this year, they are belying their statements that they will treat 2% core inflation as a target rather than a ceiling. Let me say first of all that it is of limited use. The data only goes back to 2005, so there isn't much history -- heck, online job postings didn't even *exist* until the end of the 1990s! 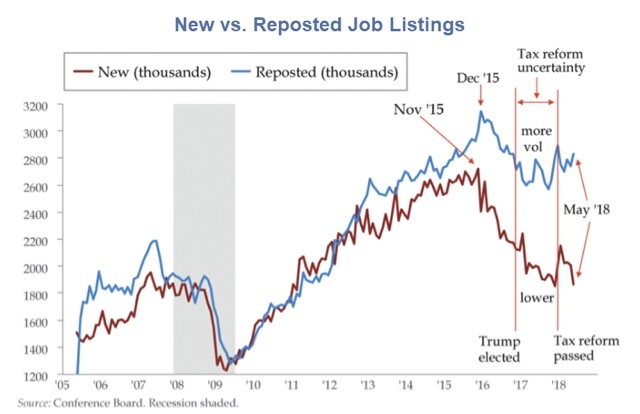 Further, online job postings have undergone a secular increase, as more and more companies have come to use it -- so I would expect the historical trend to be positive. But has it reached maturity? Or is it still in its growing stage? I dunno .... and probably neither does anybody else. In the case of online job postings, the repeat postings are either trolling for resumes on an ongoing basis, or else evidence of inability to find a suitable candidate (at the wage the employer wants to pay) the first time around. What is also interesting is how the two series converged beginning in 2006 as the 2007 recession approached. Which is what I would expect. As the job situation softens, I would expect companies to pull back on repostings more than original postings, as they become hesitant to go through with a hire if a good candidate does not appear promptly. I'm not sure what to make of the decline in both during 2016-17. It certainly was not borne out by other employment data. But for now, the two series continue to diverge. That does not strike me as a sign that companies are skittish about hiring. The cause of the increase was primarily twofold -- and neither one reflective of wage inflation. First, gas prices have increased by over 20% in the past year (red, right scale above). Note that, courtesy of gas prices, inflation for everything else except for shelter has also been rising (blue). Most everyone assumes the Fed will raise rates again later this week. Let me point out, as others have as well (e.g., Dean Baker) that this will only make housing costs *more* rather than less expensive, and so will not serve to bring inflation down, short of causing a recession. Since that time, real wages have increased only 0.3%. We'll get our best clue as to whether the ordinary American household is simply holding its own, or is in actually undergoing increased stress, when retail sales are reported later this week.